My dog says if you open your heart--and your eyes--every dog out there makes for a wonderful companion. This video is a great reminder that the abused, the neglected, the dirty, and the unsightly just need a human to see them for who they are inside and extend a gentle and compassionate hand. Check out Edie's story. It's a moving account about how quickly a dog can be won over when a human just shows a little patience and kindness. Oh, what a wonderful example...this video tells it all! Thank You for sharing it. Oh my goodness~! We had a Maltese when I was young. 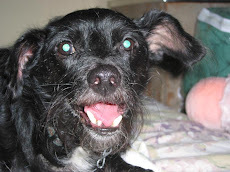 She was the sweetest little thing in the world and a faithful companion for 15 years to my Mom and me~! It's SuuuperG! Thanks for visiting, Gina. You're right. It's does say it all. Humans would be stressed out, too, if they were thrown in overcrowded prisons due to overpopulation! There are so many wonderful dogs in shelters, but the ones who are scared and matted or dirty are almost always overlooked. Yet, they are loving and loyal and just waiting for someone to save them. It's so important to adopt. So many wonderful dogs out there in need of homes, huh? Glad your family was able to save a life. We dogs are so grateful when we have someone to love us.